Two refurb projects from the 50’s. Dunno how much time I’ll be able to commit to these, so I don’t know when I’ll have results to share. As shared on a previous post, the S-38C is an attempt to reexperience my very first shortwave receiver. The KWM is an attempt to approximate my primary station from the 70’s, which was a Collins S-line (32S-1, 75S-1) from the early 60’s. The KWM-2 was the platform from which Collins derived those. The S-1 line design and performance were very similar to the KWM-2 which spawned it. The later S-3 series (32S-3, 75S-3) from the late 70’s was a significant upgrade but I never owned those. I wanted to find an S-1 pair (and may still, some day) but the collectors have really grabbed those up. The KWM-2 is much more available because it was produced in far greater numbers (many were placed into military and commercial service) than the separates (which were marketed only to the ham radio market segment). This should satisfy my desire to experience the S-1 line again, while using up less space and tying up less money. I haven’t yet attempted to date this one, but until I do I’ll call it a 50’s project as this model was introduced in 1959. I admit that it is probably from the 60’s. The model was produced into the 70’s, but a logo change took place somewhere along the line and this one has the earlier badge so it’s not a later unit. Once refurbished, I’ll use it as a backup station until I have an opportunity to swap it for an S-line inj need of attention. 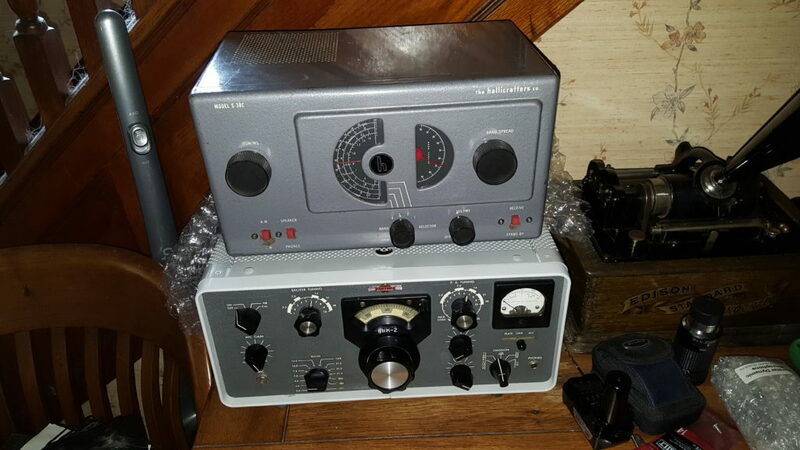 My other 70’s station that I would like to re-create was Heathkit’s later homage to the S-line, the SB301/401 pair. The design, styling, and functional arrangement were very obviously modeled after the early S-line. Mine worked great, but was eventually replaced by an S-1 pair, despite that gear being at least ten years older. I probably never managed to put as many hours on the S-line as I did on the Heathkit pair, as I owned those during my peak active years. The good news is that these sold like hot cakes and there are plenty of them out there. The prices have remained modest; I won’t have any trouble getting a set of Heathkit twins put together. All this vintage gear will be fun to have around, but it is already obvious that modern gear has the whole DSP (digital signal processing) thing figured out. As good as the S-line receiver was, and as rosy as my memory of it is, the FTDX-1200 with DSP has a vastly superior receiver. I have spent lots of time listening on that, using a short random wire on the floor. I am getting closer to getting a real antenna erected so I can hear better and also transmit. Antennas will be modest, as I am now on a very small downtown lot. I have made up a multiwire dipole that should get me on 40 through 10 meters (no WARC) and may get that strung this long weekend. I picked up a trapless vertical antenna for 20 through 6, including WARC bands, but I don’t yet know where I will place it so it may be a while before it goes up. When it does, I’ll be ready for my first-ever WARC band activity. I was never equipped for those bands before. jrcrilly on Last hot weather brew this weekend. jrcrilly on Happy New Year! Eduard on Happy New Year!